I’m incredibly excited to join the team at Bromography.com, a New York City based food website that develops recipes, reviews restaurants and attends the big food events that unite we urban dwellers and our obsession with food. My column, The Dusty Review, takes on markets, restaurants, cafes and coffee shops from the allergy-friendly perspective. I mostly concentrated on the service and the communication with the wait-staff, reporting on how presenting my food allergies is received and the options on the menu for those of us with allergies or those who follow a vegetarian or vegan diet. My second review came out for Bisous, ciao Macarons, a delicious bakery in the Lower East Side. This review is paving the way for my review of an incredible book, Mad About Macarons, and interview with author Jill Collana. I also reviewed the adorable cafe, Fatta Cuckoo, also in the Lower East Side. 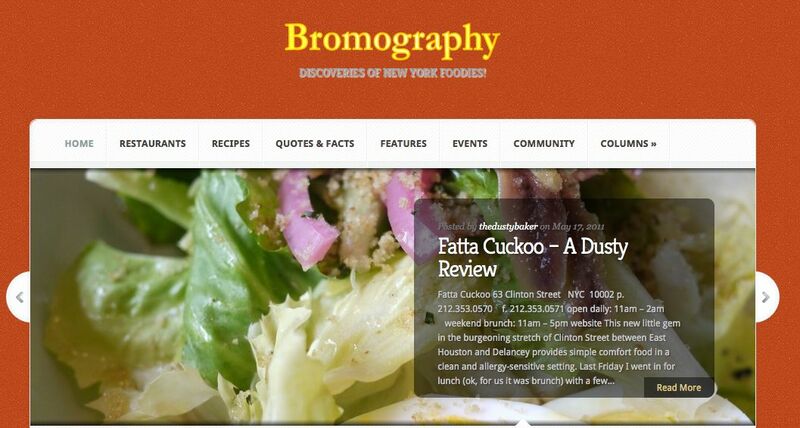 Please check out Bromography.com and get the scoop from New York City’s obsessive foodies! When traveling to perform, I get to glimpse into the lives and the vibes of different homes and cities. I’m currently performing in The Enchanted April at the Hampton Theatre Company and living in the director and producer’s peaceful, beautiful house right on the bay. It’s filled with plants and artwork from all over the world. I take their dog, Mia, on morning walks past fields of flowers and houses with perfectly manicured laws. From my attic suite (which makes me feel a little Louisa May Alcott as I write and draw), I can see water. When I open the window, the scent of flowers fills the rooms. I feel extremely fulfilled from working with this character and this incredible cast, who have been so warm in welcoming me into their lives. And with some time to spare during the day (with rehearsals coming to a close), I’m baking some cookies for concessions. 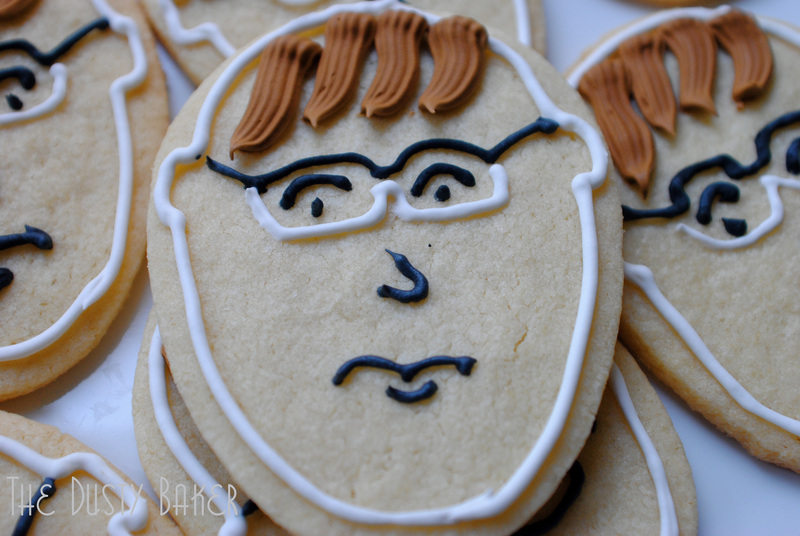 I couldn’t quite put a gluten-free, allergy-friendly cookie out there (both to limit costs and appeal to the appetite of this particular audience), but knew my contribution had to be something special. The show is about four women who escape from their troubles in rainy London to a castle in Italy, where “in April it is simply a mass of flowers” as “bushels and bushels of wisteria” flank the terraces. Eventually, they all find their happy endings, their hearts warmed by the Italian sunshine, the “unusually fresh” sea air and facing their demons amongst the company of strangers who soon become friends. 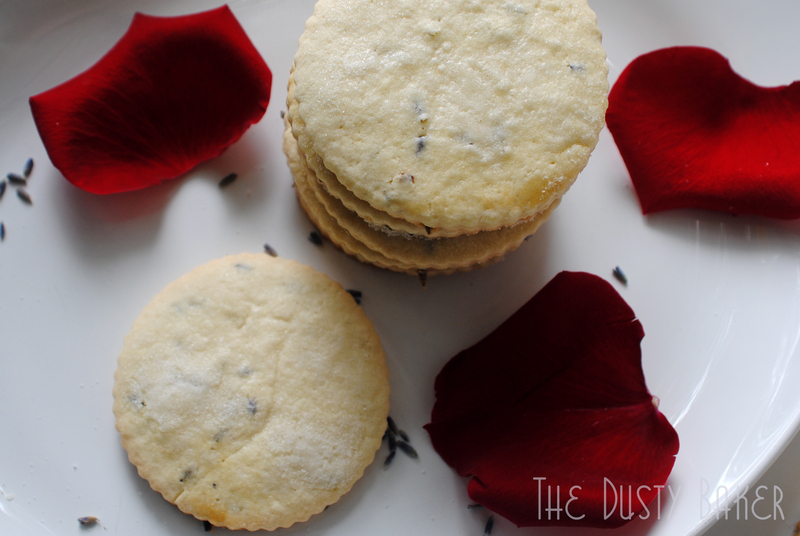 So my contribution is a traditional English shortbread cookie, laced with rosewater and dried lavender. Simple ingredients, a little time and patience, and a beautiful, garden-scented result. With a hand mixer (or in a food processor) beat butter and sugar until smooth and fluffy, about two minutes. Add eggs and blend to combine. Add flour, cornstarch, lavender and rosewater and mix just until a dough ball forms. Remove from mixer, separate into two balls and flatten into disks. Wrap in plastic and put in refrigerator for at least one hour. Line baking sheets with parchment paper and flour work surface. If the dough is still too soft, knead in a little more flour. Use a spatula to transfer to lined sheets, wash lightly with egg white and sprinkle with sugar. Bake for 15-20 minutes (depending on size), switching racks halfway through baking, until slightly golden at edges. Notes: I made two sizes (one to sell and smaller ones with the extra dough). Other than rolling the smaller size a bit thinner and baking for a shorter amount of time, they came out with equally beautiful results. The pictures above are of the larger ones that I brushed with egg white before sanding with sugar. The picture below shows the smaller cookies that weren’t brushed. To keep with the traditional sheen of a shortbread, I think from now on I will not egg wash the cookies before baking. Broken hearts are messy. As is this (Broken) Heart Pie. In my mind my submission for Pietopia’s friendly competition which asks “what does your life taste like, in a pie?” was a bit more elegant, a bit more pulled together. But I guess that’s the thing about a broken heart in a dusty kitchen. Things aren’t always going to come out the way you had hoped. And that’s okay. Just like I will be. Red fruits, lots of them; rich and luscious and sweet and syrupy. Candied nuts. Ginger. Cinnamon. Molasses. Warm flavors. All things ripe and sweet and full of color and bursting with love. For as much as my heart is very much broken, it is still bursting with love. Both for the person who broke it, and for myself. I’ve never been in such a humbled position. So, the creation. I decided to cut myself some slack and not make homemade ginger molasses cookies, as I’m not in my apartment with my arsenal of tools. I picked up a box of Ginger Cookies with Sliced Almonds from Pamela’s Products. They’re very moist and gluten and dairy free, so all I had to do was crush them, mix them with about 3 Tbsp of melted unsalted butter, press into a pie plate and bake for a bit. I should have bought two boxes, to make a fuller crust, or gotten off my tush and made a pie crust as I have dozens for times before. But again, dusty. So the crust only covers the bottom and slightly up the sides. 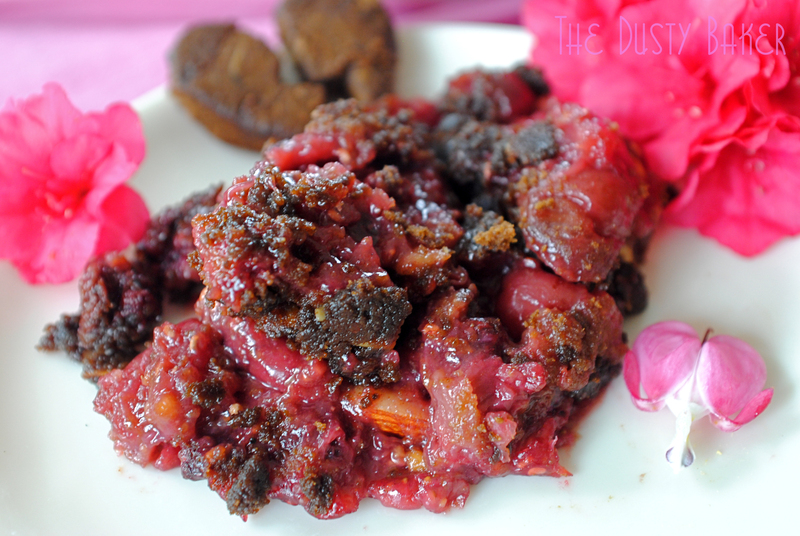 I guess this is more like a (Broken) Heart Cobbler. Same difference. 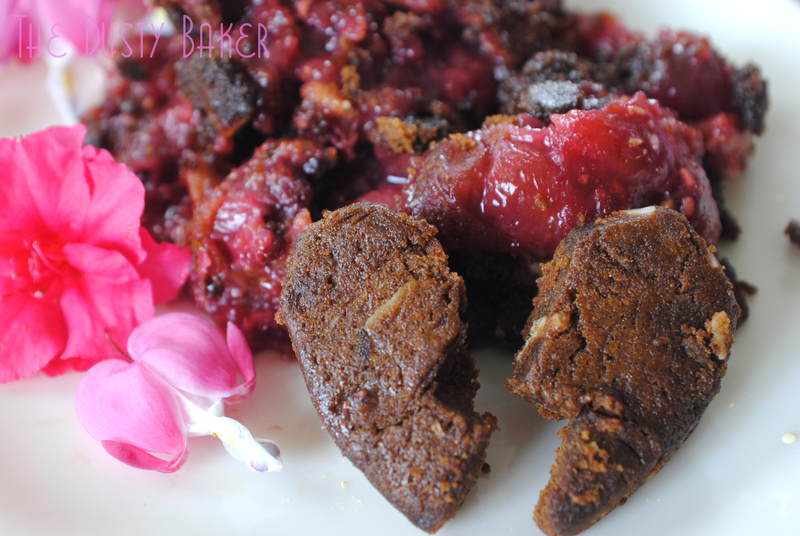 The recipe for the filling is below, and I suggest your favorite sweet crust – using a ginger snap or molasses cookie seems to suit these fruits perfectly. And because of the cookies I used this pie was gluten-free. And had I used Earth Balance instead of the butter in the crust, it’d be dairy-free too. While I only had a small bite of the final product, I can promise you this pie (cobbler, whatever), is very luscious, very sweet, and almost sanguine. The cast* gobbled it down after our run-through tonight and seemed pleased, saying they were fortified with the fruit and nut combination, and it disappeared quickly. I didn’t tell them the name: (Broken) Heart Pie. 1/2 cup candied almonds (I used sweet cinnamon almonds roasted from Whole Foods, but here’s a solid recipe from Food.com). Prepare whichever pie crust you prefer, and blind-bake it (bake it without anything in it) until done. Remove from heat while you prepare the filling. Place the pitted cherries in a large, preferably non-stick pot or dutch oven. Bring to medium heat and allow some of the cherry juices to reduce, around five minutes. Add the raspberries and strawberries, and continue to cook until the mixture first bubbles with juice, and then begins to reduce, about 8 minutes. You want the mixture to still have some juice, but not so much that it’s overwhelming the fruit. Whisk together the sugar and starch, and pour over fruit. Mix thoroughly until incorporated (if you’re using honey, add that first and mix in, and then the starch). Return to low heat and continue stirring gently until the mixture thickens. When almost cool, stir in dried cherries and almonds. Set in the refrigerator until completely chilled before serving. *Shameless plug: I’m performing in Enchanted April at the Hampton Theater Company, running from May 26th to June 12th in Quogue, New York. If you’re near the Hamptons, please come check it out. It’s a darling show with a lot of heart, and some really challenging and fulfilling moments for me onstage. 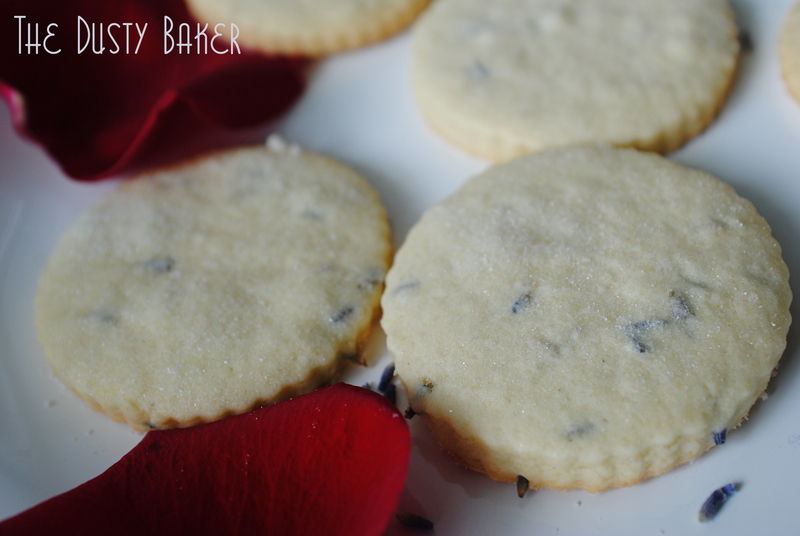 And I’ll be selling garden shortbread cookies at the concessions. I’m out of town, rehearsing a show in the gorgeous Hamptons, and staying with my director in her… well, let’s just say the house I’m staying in is quite, perfect, in my opinion. Her and her partner grow almost all of their own vegetables, they live on the bay (so I see water outside my window!) and they COOK for me!! As my boyfriend and roommate don’t really cook (cough), this is a luxury. Fresh salads of garden spinach, asparagus, vegetable soups… all that AND I’m staying in a en suite attic that Louisa May Alcott would have found much inspiration in. That said, I don’t quite have a kitchen or my equipment to do much cooking in at the moment, other than the one day a week I run home for a visit. So there hasn’t been much posting since I’ve started here. But one of the things I love about doing shows outside of New York City is exploring new areas… and new areas of FOOD! So browsing through the local health supermarket the other day I found a container of Pete and Gerry’s Platine Bleue Hen Eggs and immediately rushed back to show them off. From Pete and Gerry’s: The indigenous Mapuche people of South America have produced blue eggs since the mid-sixteenth century. Their Araucana chickens developed fully feathered faces as insulation against Patagonia’s frigid winters. 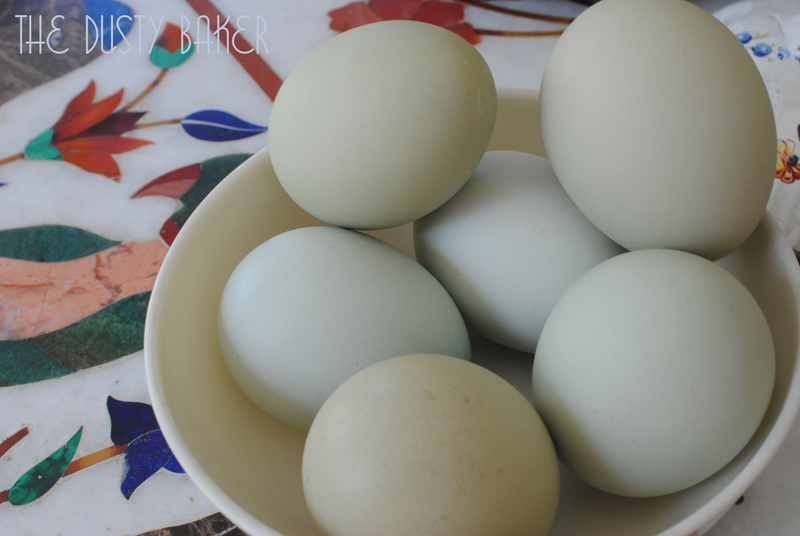 The eggs vary in tone – some are striking on the outside, some a pale slate color. 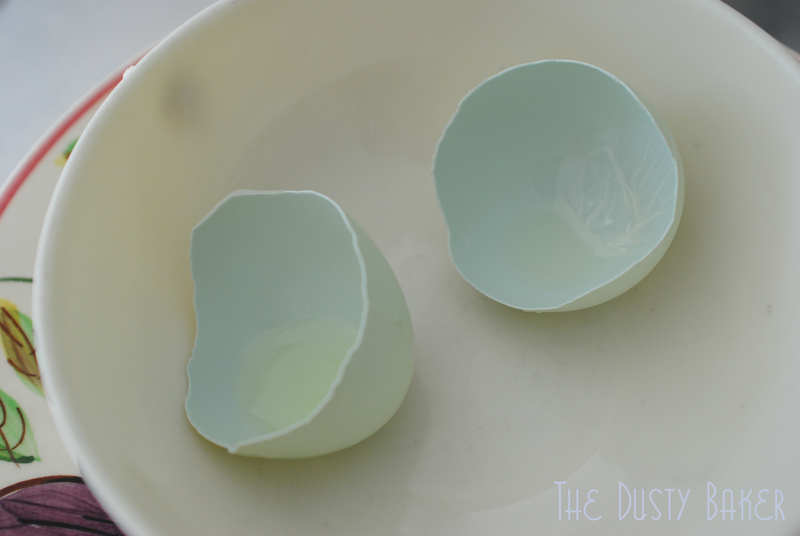 The inside of all eggs is a smooth, vibrant pastel blue, which reflects light in quite a magical way. None of the pictures in this post are altered – this is how the morning light hit them. To fully experience the allegedly deep and rich yolks, I cooked one over low heat in an ungreased skillet and then boiled the rest, making sure to only let them simmer and sit in hot water until just cooked, then ran them under cold water to stop the process and help the egg pull from the shell. The word in the hen house spoke truly – look at that yolk!! So powerful even the “white” around it had no choice but to take some in! 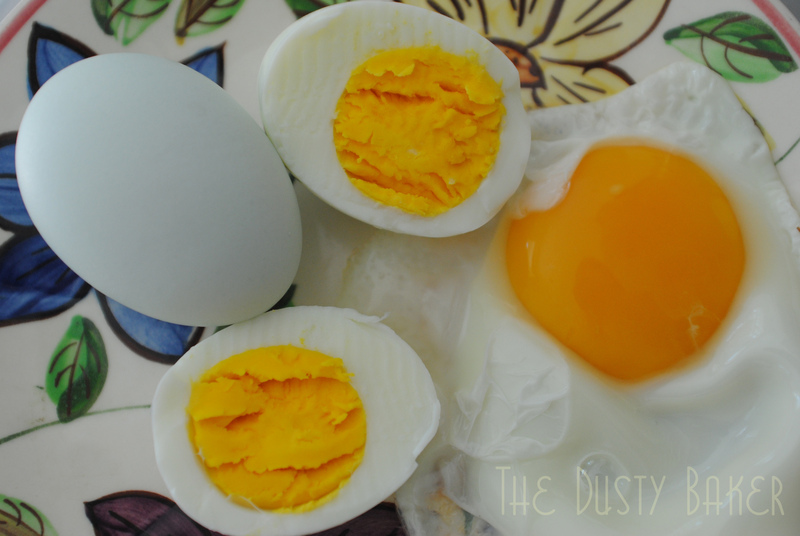 These eggs seem to have a bit more protein than normal hen eggs, and I would challenge anyone to a duel were they to suggest separating these eggs and only eating the whites.The boiled eggs produced the same incredible colors – the yolk practically dousing sunshine. They also took up a great deal more room of the actual egg – I imagine they would make a stunning frittata or quiche. But how do these beauties taste? 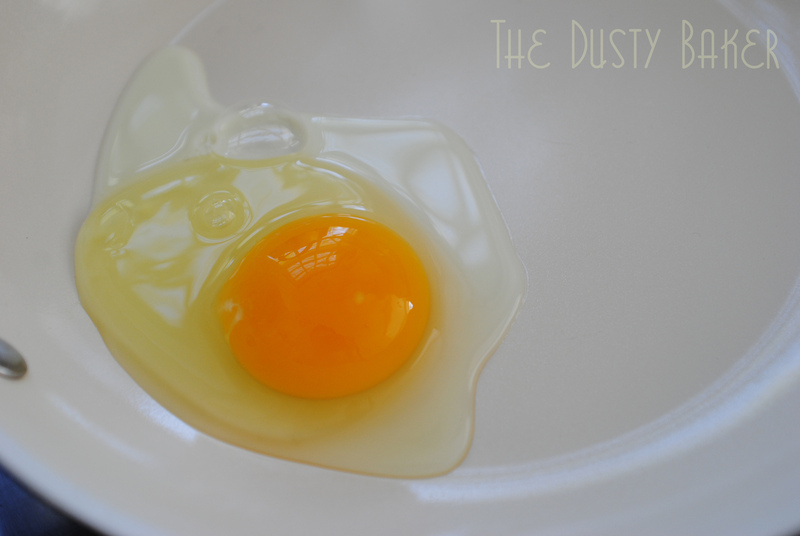 The yolk, my housemate Jess and I noticed, was so creamy and soft, almost buttery in flavor and quite indulgent. The white was crisp and clean – the perfect canvas to showcase the yolk. Dusty conclusion? 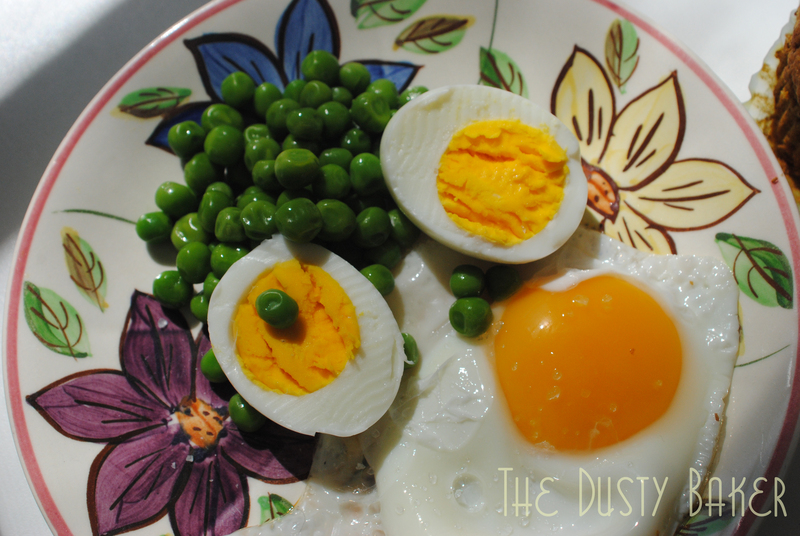 Don’t try to show up the simple delicacy of these Platine Bleue eggs by doing too much to them. Yes, they probably make a killer creme brulee. But cooked simply and perfectly, seasoned with a tiny bit of sea salt and a side of fresh veggies – there is little more I’d ask for in a breakfast. Yesterday morning I awoke to Autumn, not Spring, dripping its way down my New York City windows. It was chilly, much more so than I’d want for a May morning. And though I had very little time to get a bunch of stuff done before yet another commute east for rehearsal, I found myself craving something grainy and warm. 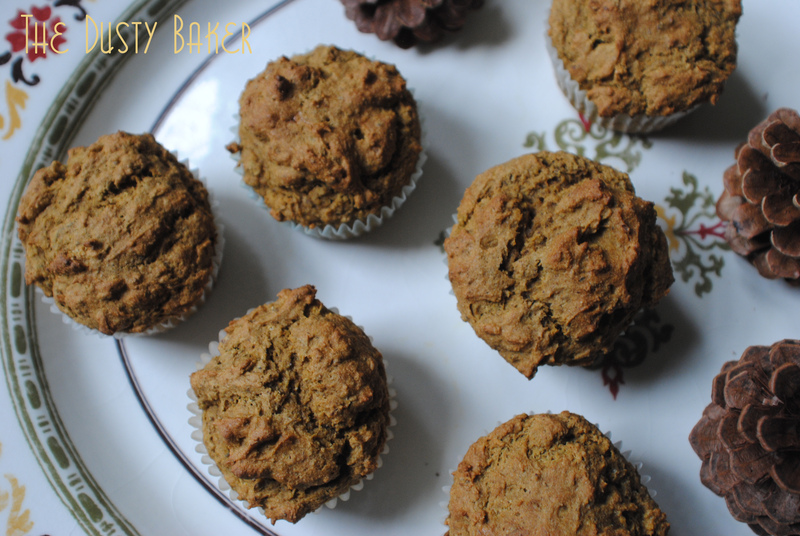 And luckily there’s always time for… muffins!I love making muffins because of how easy and versatile they are. I obviously wasn’t going to go out to get any ingredients, and I didn’t have an apples or rotting bananas on hand. So I scoured my pantry and found an old can of sweet potato puree left over from my waffle experimentation. Line 12 muffin tins with liners or spray with cooking spray. In a large bowl, whisk all dry ingredients until thoroughly incorporated. In a smaller bowl, mix eggs, sweet potato puree, maple syrup, butter and milk thoroughly until smooth. Fold the wet ingredients into the dry until just incorporated and a bit lumpy. Fill evenly into tins and smooth with a spoon. Bake for 22-25 minutes or until slightly browned on top. For nutritional info please go to this recipe on CookEatShare. Recipe is loosely based on one by Michelle at TasteAsYouGo. Please support her blog! 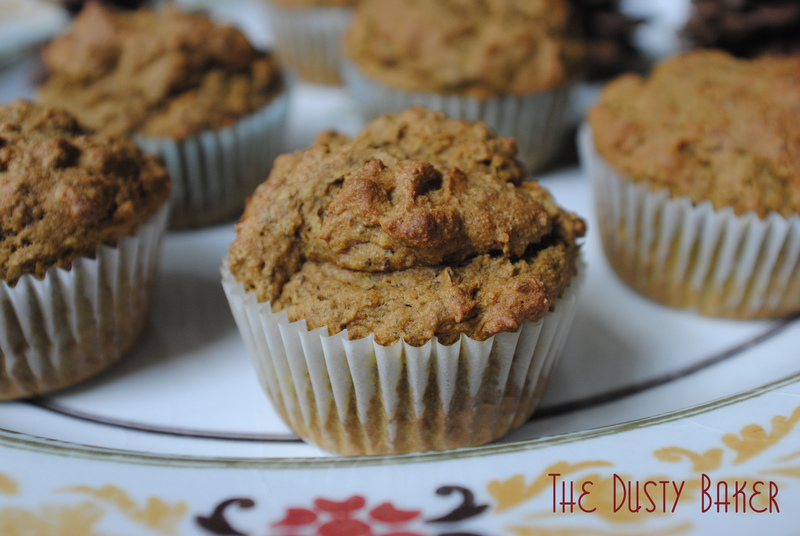 This is my first recipe post joining Christianna and a delightful crew of bloggers for the Burwell General Store Recipe Swap! The premise is that bakers/bloggers take a recipe that Christianna passes along and, changing at least three things about the recipe, adapts to their whim and fancy. Fun, right?!?! I’ve enjoyed many happy moments paging between the incredible foodies and they’re takes on an old, homey recipe. It’s just inspiring to see how imaginative people who truly love food can be. Please check them out at Burwell General Store! This month’s recipe: Ozarkian Taffy Apples. The caramel apples I remember from my youth were sticky and delightfully, sickeningly sweet; a rare treat reserved for fairs and trips up north to quiet New England towns during the hot summer. But now I’m an adult. Living with gluten and dairy allergies, hypoglycemia and a waistline that has started getting smushy since this Dusty Baker thing entered my life! For the sake of my digestive health, the way my body feels and how I feel in it, I needed to develop a recipe I can feel confident in. And I did! 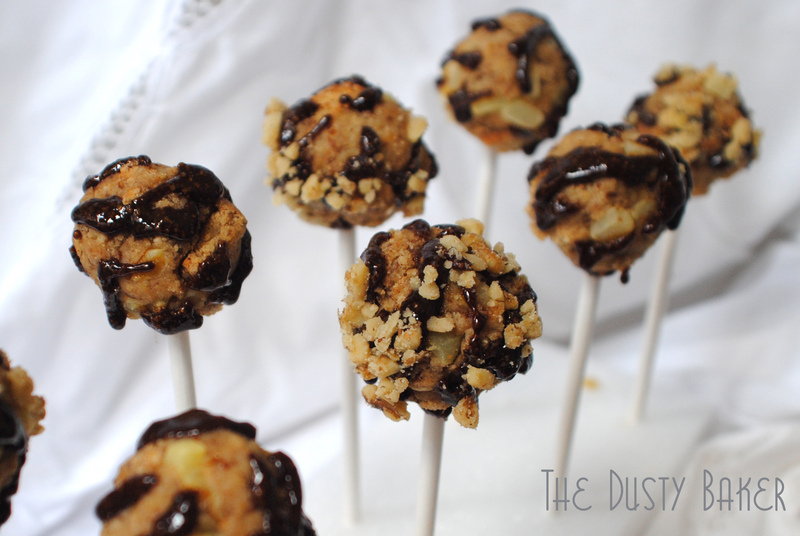 Caramel Apple Cake pops!! 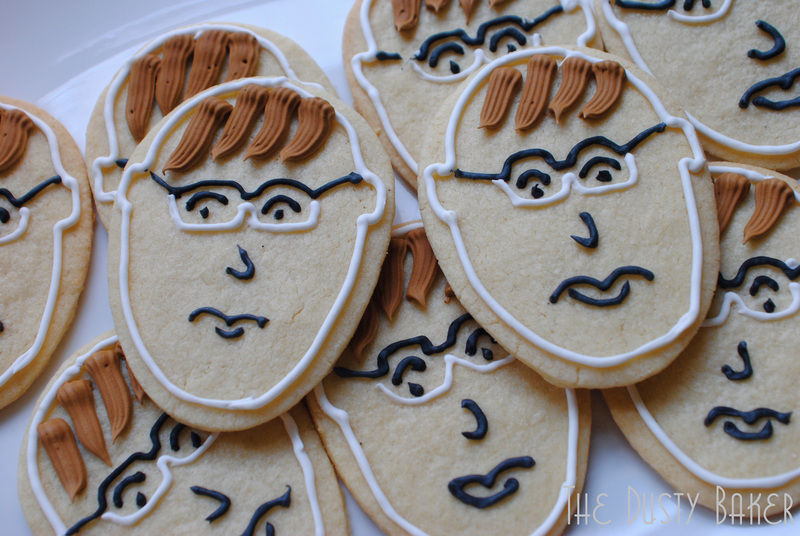 I’ve seen these floating around the internet food world and, of course, at Starbucks. They look like a nap to me (as in, if I ever ate one I’d probably clean every apartment in my building, write a novel and then crash for two weeks in exhaustion). But they’re adorable. 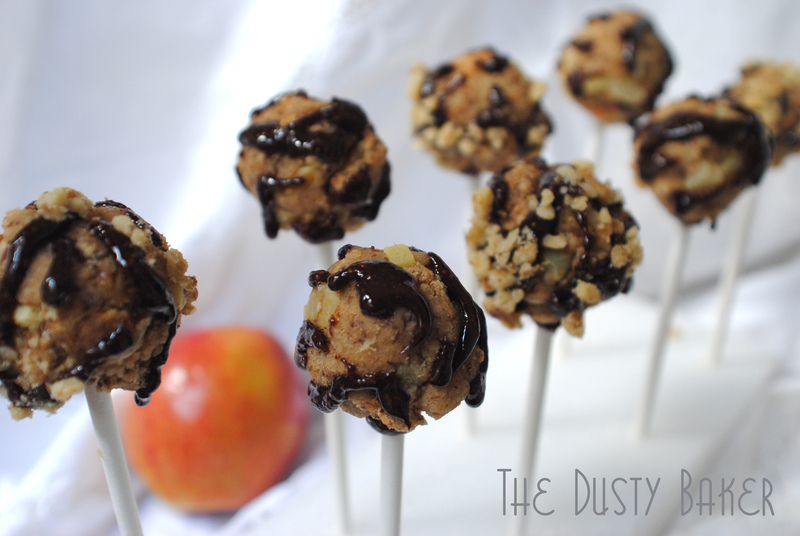 So, I made a healthier cousin to the caramel apple that retains the yummy-tastiness and the visual appeal. 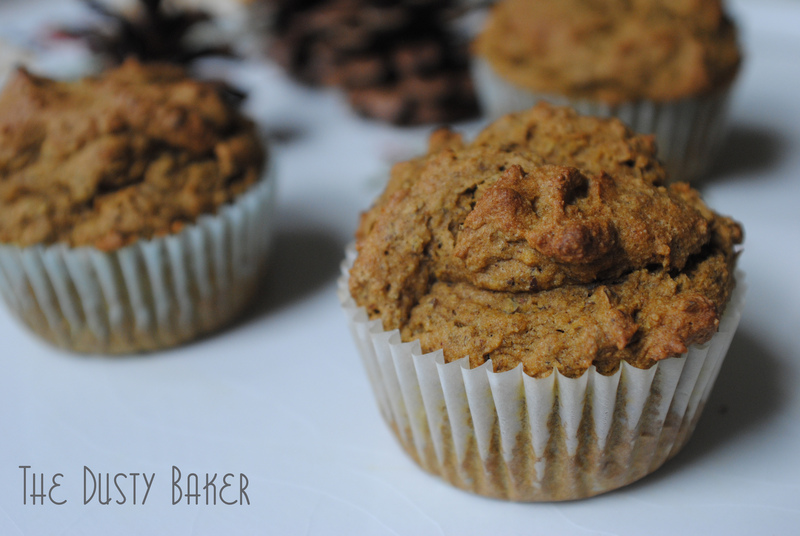 Gluten-free, dairy-free, white-sugar-free, and delicious. I used my gluten-free cake flour blend because (a) it’s blended already! and (b) it has a lot of starch so will hold together well and support a good amount of moisture. If you don’t have the time or know-how to blend your own flours, use an already mixed blend like Bob’s Red Mill or King Arthur and simply add 1/2 tsp xanthan gum per cup of flour you use. To cut down on the fat of basic apple bread/cake recipes, I used apple sauce instead of oil which provided moisture and upped the apple taste. And to get rid of the white sugar completely, I used pure maple syrup in the cake and sucanat in the caramel. Speaking of which: next big problem – candy coating!! I’m not good with candy. I mess up “easy” peanut brittle. My carob coffee and carob coriander candies definitely are yummy, but they don’t involve thermometers or “soft ball” stages. And I had vowed against white sugar. So slowly-caramelized sucanat was the best this Dusty Baker could come up with (made while I clicked my cowboy boots on my crumbling linoleum floors and danced to Michael Franti, Dusty style). Honest results? My roommate and I loved the cake. So much so that, while we enjoyed the pop of the caramel candy crunch, it was the cake that took such precedence that we agreed we just wanted to eat MORE CAKE! 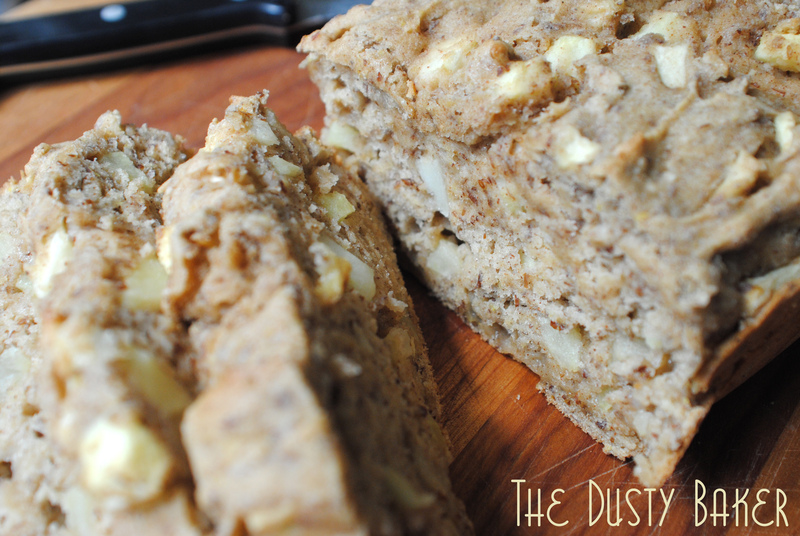 It is incredibly moist, and the sweetness seems rich yet light and not overpowering. If you choose to make the cake on it’s own, I recommend adding a drizzle of maple syrup on top of the cake while uncooked in the pan, and then swirling it with a fork. This will give the top a great color and caramelization. But if you want to continue on in making an adorable, caramel-apple miniature with a sweet crunch, continue with rolling this incredibly mushy bread into a ball and drizzling with sucanat caramel coating. Oh, and according to the nifty nutrition converter at CookEatShare, these only have 57 calories a pop!! Take that, Starbucks, with your 300 calorie woppers! Thank DOG I didn’t know that when they were sitting in my kitchen! In a large bowl, whisk together your flour, flax, almond flour, cinnamon, baking powder, baking soda and salt. 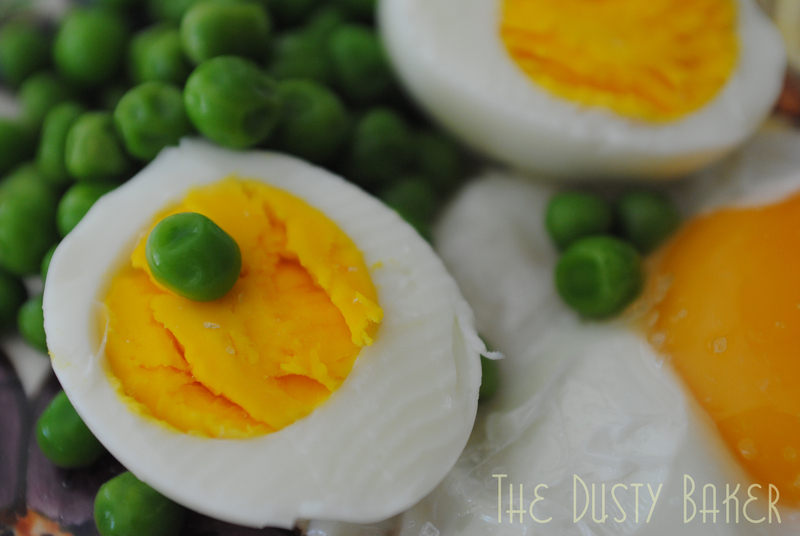 In a small bowl, whisk the eggs thoroughly until creamy. Add the apple sauce and maple syrup and whisk to blend thoroughly. Add the wet ingredients to the dry and mix with a fork or spatula to combine. Bake in a lightly greased loaf pan for 45 minutes or until a toothpick inserted comes out clean. Cool for 5 minutes in pan, then turn onto wire rack and cool until just slightly warm. In a small saucepan over medium/low heat, combine water and sucanat. Slowly let this melt and combine until it forms a dark syrup. It should trickle when you pull it from a fork, but in small clumps rather than a stream. This took me about 15 minutes. Meanwhile, cut the cake into chunks in a large bowl and smush with your hands until broken. Roll into 1 1/2 inch balls and place on a plate. When the caramel is smooth, poke a candy stick into the center of a ball to make an indentation. Then remove the stick and dip in the caramel, and reinsert. 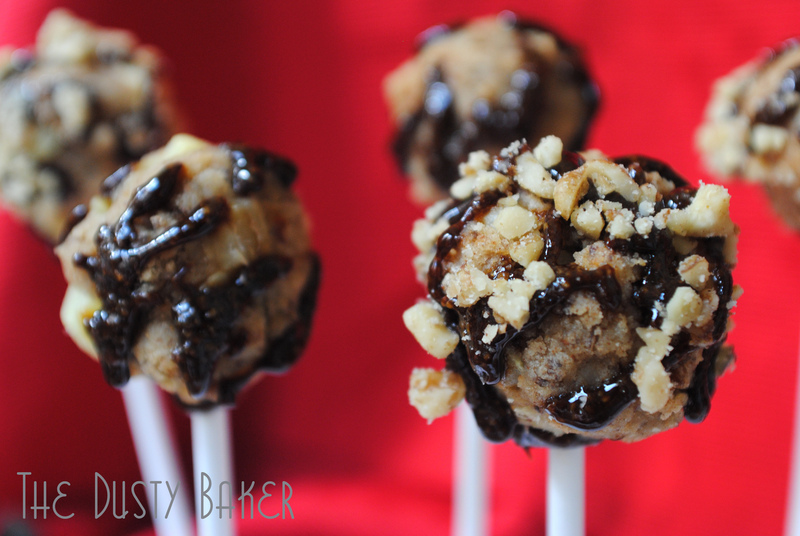 Drizzle the cake pop with caramel and press into nuts, if desired. Repeat until all the pops are assembled, or until you’ve eaten all the mushed up cake in the bowl and then blamed its absence on your roommate’s cat. Wait, what? Check Out the Other Creations From The Recipe Swappers! Lindsay puts amazing honesty and simplicity written into her recipes. She loves Oregon, its ingredients and Portland’s lifestyle, and it shows. Chef Dennis is veteran chef in his own right. The rest of his fantastic food blog can be seen at morethanamountfull. Mari lives in Oregon wine country and is a budding wine connoisseur. Visit her at The Unexpected Harvest. Joy, holding down a dairy-intolerant household, doesn’t let that restrict her love of flavors and food, in fact, it inspires her to do what she does. When you visit her blog, be sure to check out her “ubiquitous about page” and the balcony gardening category. Monique has been food blogging since 2007, and her first recipe was a BLT-inspired chicken pot pie! Shari is our first International participant! Writing from down under, we cherish her voice in the swap because she brings the results of additional recipe challenges; the seasons are flipped from where most of us are blogging. Jennifer‘s tag line says it all: Life is too short to eat bad food. At her blog, Adventuresome Kitchen, you will find a passionate food-type, feeding her family amazing meals and living to blog about it. The Cake Duchess. The name says it all, and Lora’s recipes are rock solid, creative, decadent, inspiring. Mary is a lifelong resident of the San Francisco Peninsula and was diagnosed with Celiac Disease in 2007. Her search for a gluten-free chocolate chip cookie that didn’t taste, look or feel gluten-free inspired her blog and she’s been happily baking ever since. Jamie blogs at Random Acts of Food and has a love for food that only an Italian could! She enjoys cooking and baking in all cuisines for her family and friends. Claire blogs with Texas pride from Dallas. She loves chicken fingers, Law and Order SVU and is left handed. Cindy, food lover, all-around awesome person and her knowledge about US restaurants is almost encyclopedic. Check out her quirky and fun blog. Sabrina Modelle blogs at The Tomato Tart from the San Francisco bay area, and for her first swap (the Lemon Cake) she made a Brown Sugar Lemon Rosemary Cake with Rosemary Caramel. Linda is a saucy Texan with an encyclopedic knowledge of food. She’s published many cookbooks, won many awards, and has been the source of many belly laughs. When she’s not writing books, her latest creations can be found at Everybody Eats News. Tricia is the founder of Pietopia, an annual pie contest that asks “What does your life taste like, in a pie?” and her beautiful work as an eating designer and blogger can be found at Eating Is Art.